Robin Winks and David Ausubel were both Fulbright scholars who came to New Zealand in the 1950s and wrote books about the country. They shared some views, about New Zealanders' inability to accept criticism, and their insularity and narrow-mindedness, smugness, hypocrisy and drinking habits. However, Winks was more effusive in his praise of both the people and the landscape. Perhaps because of his more intensive critique, Ausubel's The fern and the tiki provoked more interest and controversy than did Winks's These New Zealanders. At least some of Ausubel's criticism of New Zealanders' attitudes was shared by local intellectuals at the time, such as Bill Pearson and R. M. Chapman. Reference: Robin W. Winks, These New Zealanders. 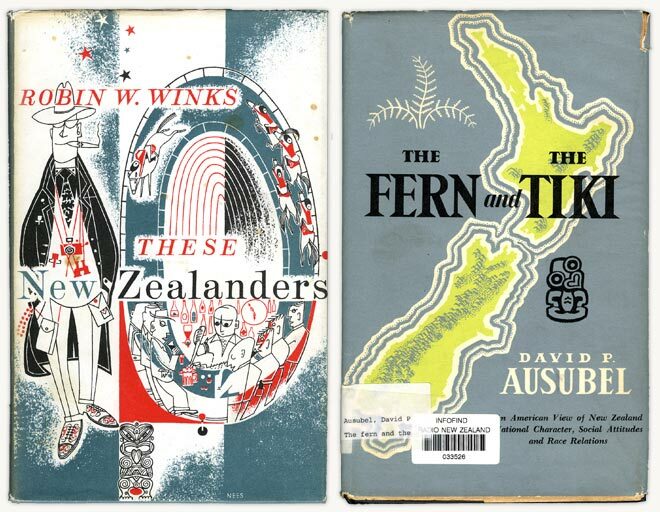 Christchurch: Whitcombe & Tombs, 1954 (left); David P. Ausubel, The fern and the tiki: an American view of New Zealand: national character, social attitudes and race relations. Sydney: Angus and Robertson, 1960 (right).